Founded in Miami in 1999, the Ultra Music Festival has maintained a commanding presence in its Florida home each year, and has now expanded to several cities all over the world. In February 2014, the festival will make its way to South Africa for the first time, with installments taking place in Cape Town and Johannesburg. Ultra Music Festival has made a name for itself as one of the top electronic music festivals out there, with Miami attendance surpassing 100,000 in the last few years. Other locations for the fest now include Buenos Aires, Argentina; Hvar, Croatia; and Ibiza, Spain. The outdoor festival will then make its way to Cape Town’s Ostrich Farm on February 14th, and the Nasrec Showgrounds in Johannesburg on February 15th. 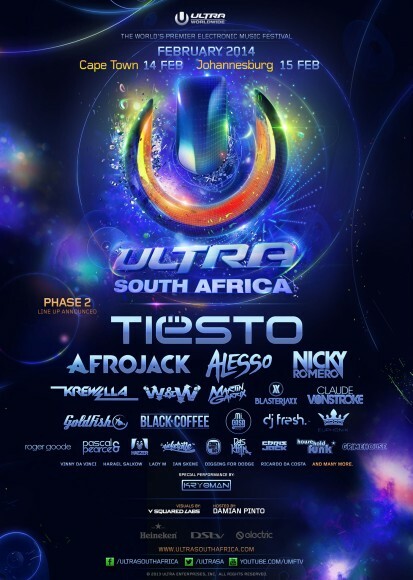 Tickets for Ultra South Africa can be found here.